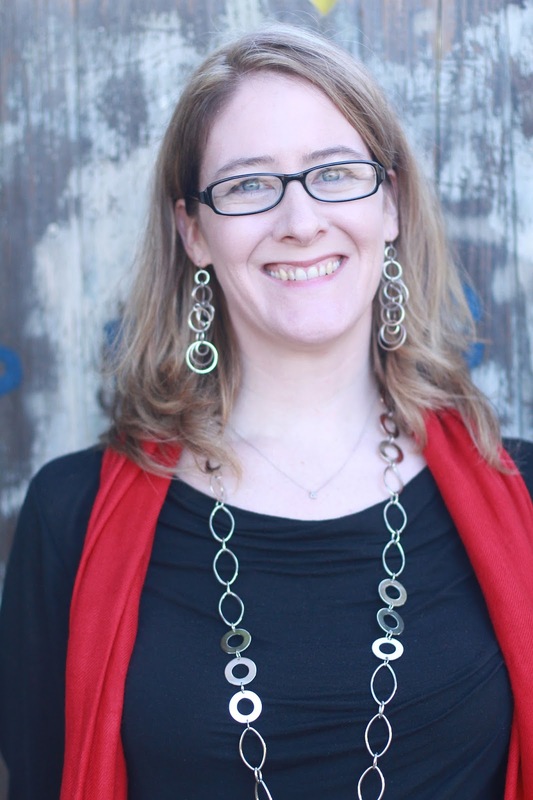 Let's welcome Erin R. Dooley to the blog today! 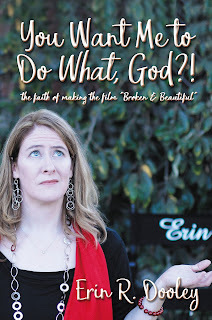 She's an award-winning screenwriter who wrote a book called "You Want Me to Do What, God?!" that gives readers a behind-the-scenes look at how her movie Broken & Beautiful was made. She's also giving away one copy of her book! Details are below toward the end of the interview. The movie releases on Feb. 14, 2018. Erin will return to this blog later in February to talk about it. But for today, the focus is on her book! Enjoy my interview with Erin! Hi Erin! Thanks for agreeing to an author interview on my “God is Love” blog. We’re going to talk about your new book and “the faith of making Broken & Beautiful” which is your movie that’s coming out in February 2018. Alexis: Why do you believe that God wanted you to write this book? Share the story-behind-the-story. Erin: I wrote the book first as journal for myself, on the encouragement of Amanda Cleary Eastep. She's my friend and former co-worker. There were so many “God moments” that happened, that I just had to write them in a journal. As I was getting funding and securing every other element of pre-production, I would share the story of how God called me to make the film. This seemed to touch people, so I continued to share it. I was especially taken with the fact that some people who are not religious, people who had fallen away from the church, seemed to be impacted by the story. When you step out so strongly in faith, people resonate with that, whether or not they are people of faith. As I prepared to release the film, I thought I would be remiss if I didn't release this book. For me, the beauty of this film is how it came to be. I am proud of the film and think that on its own, it can impact people, but the making of it can equally impact people. Alexis: What is your relationship with Amanda Cleary Eastep who wrote the Foreword for your book? Describe the role that she played in helping you write this story. Erin: Amanda Cleary Eastep and I used to work together. We weren't in the same department, but I would have frequent meetings with their department. We began having lunch together quite often and our conversations turned toward our shared love of writing. Even after we no longer worked together, our friendship and support of each other's writing remained. Amanda is a wonderful woman – encouraging, thoughtful, insightful are just a few of the top characteristics that come to mind. She was a constant cheerleader and prayer warrior on this journey. When I was writing my book, it was only fitting that she write the foreword, since she was instrumental in me writing the book in the first place! Alexis: What advice do you have for people who are striving to do God’s will even when they do not understand? Speak from your personal experience. Erin: Part of what I say in the book when I talk about this is first, you should be in prayer. Prayer will help you discern if what you are feeling is from God. Seeking counsel from people who are strong in their faith is also helpful in understanding if God is calling you to do something. Once you feel secure that God is calling you to do something, it still may not be comfortable. He often calls people out of their comfort zones. This film was the biggest undertaking I had done up until that point. I told God he had the wrong woman. The title of my book really was my response, and maybe your response – God is asking you to do what? What I can say, now being on the other side, is that God will be there with you. He won't ask you to do something and then bail on you. Remain in prayer. The way I've taken to pray is, “God, I believe this path/decision is what I am to do next. I will do this next thing. If it is not right, please redirect me and open the correct door.” Every step of the way, keep checking in. You may not get total clarity, but God usually gives enough for you to take that next step He needs you to. Alexis: What about writing this book brought you the greatest joy? Erin: Honestly, I like the reaction when people hear the title. It disarms people and makes people smile. I think that makes people more open to reading the story. I have a very personal relationship with God, where I do speak with Him so casually I can respond to Him with a question like “You want me to do what?”. It's not some “holier than thou” story. I'm just a woman who loves the Lord and wants to serve him in my daily life, using the talents He's given me, who is sharing her story. It seems like that approach makes people more open to hear about a journey of faith and think about their own life. Having God use me to help bring others to Him is my greatest joy. Alexis: What was your most difficult challenge in writing this book? Explain. Erin: The book is primarily based on journal entries written during filming, so I needed to make some changes to put them in chapters that had some cohesion and flow. I also wanted to strike a balance between a behind the scenes on the logistics of making an ultra low budget film and the faith aspect. I also hadn't journaled as much once filming started, so I had to go off my memory, which was a challenge because I have a notoriously bad memory). Alexis: How did you learn to understand and trust God’s timing? Erin: Truthfully, I can still sometimes struggle with this. I do try to look for lessons I may need to be learning if I feel like God is making me wait for something. Another co-worker of mine used to always say “Time is going to pass anyway, so you may as well make time work for you.” That stuck with me so that I don't waste time. If I'm waiting, there may be a reason and I can at least do something while I wait. Alexis: What would you say is the most valuable life lesson that you learned while going through the experiences that you’ve written about in this book? Erin: I would say that I learned that God's dreams for you may be bigger than your own. Even if he's not calling you to do something on a big stage, he may be calling you to be a bigger, better person than you are right now. I have grown immensely in following God's will in my life and where I am right now is not where I would be if I had followed my own plans for myself. Alexis: In your book, your sister told you that she had a dream that a man approached her while she was in Subway (the restaurant) saying that He felt impressed to give her money to make a movie. Did that ever happen? If not, how did you get the funds to make your movie? Erin: Ha! Don't I wish she met a mysterious benefactor at Subway. I mean, she didn't really even try and hit up some Subways, but I've given her a pass on that. I held some fundraising events and then basically asked anyone and everyone I knew to contribute. Since it is a faith-based film, a lot of people I knew were inclined to give. And going back to an earlier question, really sharing how I felt called by God really inspired generosity in others. Alexis: I like how you started each chapter of your book with a Bible verse. How did you go about choosing the most appropriate verse for each chapter? Erin: Thanks. I did quite a search through the Bible with some keywords and had a list of maybe 30-40 verses. Then I made bullet points of each chapter's main points. I looked through my list and did my best to match it up with the main theme of the chapter. Alexis: In what ways do you hope that this book will help your readers? Erin: I hope people will think about how God may be speaking with them and see what God could be calling them to do. Like I say in the book, some are called to something big and will influence many people, and others are called to influence a smaller circle of people, perhaps their children and family. No matter the size of your call, there is value in it. Whatever God is asking you to do, do it! Alexis: Now that this book is written, what’s next? Erin: Right now, I am very busy with the release of the film. Both the book and the film “Broken & Beautiful” come out on February 14. Then I will embark on a 10-city tour with the film, going from California to the east coast. After that, I'm not sure just yet. I'm seeing where God is leading! Alexis: Thanks for the interview, Erin! God bless you. Erin and her projects have been featured in 20 different media outlets, including Newsweek's "Guide Of What To Watch." "You Want Me to Do What, God?!" is her first book. She lives in Los Angeles County. About the book: You Want Me To Do What, God?! is a look at the faith of saying "yes" to God's call even when you don't understand what He is asking of you. 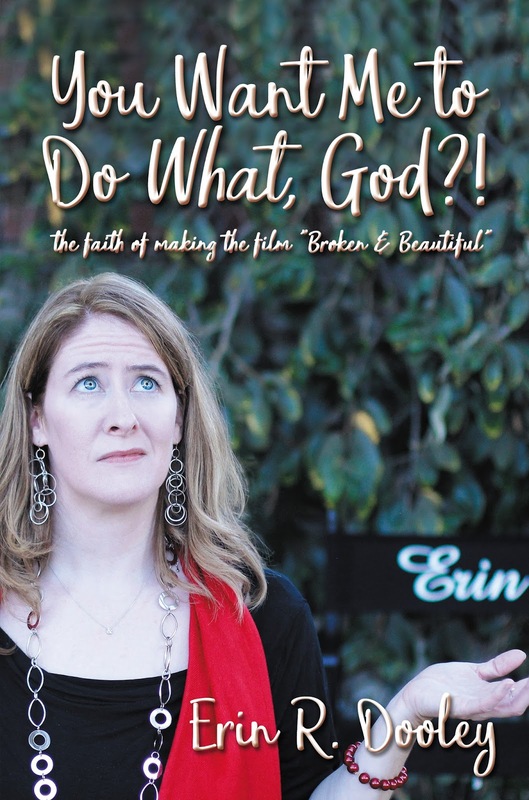 Written in a conversational tone, author Erin R. Dooley takes the reader behind the scenes of making the faith-based film Broken & Beautiful. Part devotional, with scripture verses and reflection questions, and part testimonial, based on journal entries during filming, the book presents an approachable perspective to living out your faith. I enjoyed this interview immensely! "He often calls people out of their comfort zones" is so true! He stretches us beyond what we think we are able, and then He shows us how He can work through us. Great interview! Thanks, Becky! If you are in a city where I'll be screening the film, it would be lovely to see at the theater!